Every year at the end of spring, we ceremoniously enjoy our ‘last oven baked’ dinner for the summer and start planning all the yummy foods we plan to grill. Since we plan to live in our pool for the next several months, we want to make sure we are well prepped for fast, easy dishes that can be cooked and consumed in between cannonballs and croquet putts with minimal clean up required. If you’ve already tried grilling pizza, you know how over-the-top tasty they are; if you have not yet, you are in for quite a treat! The grilling gives the pizza a fired oven taste, with some smoky and charred bits at the bottom that are just perfect.Go light on the toppings as the crust will cook fast and when making your dough, make some extra for the freezer…simply wrap each dough ball air tight and freeze for up to 3 months, defrosting slowly at room temperature. Note: you can try store bought dough, but only fresh dough…the ‘canned’ dough will burn before rising. 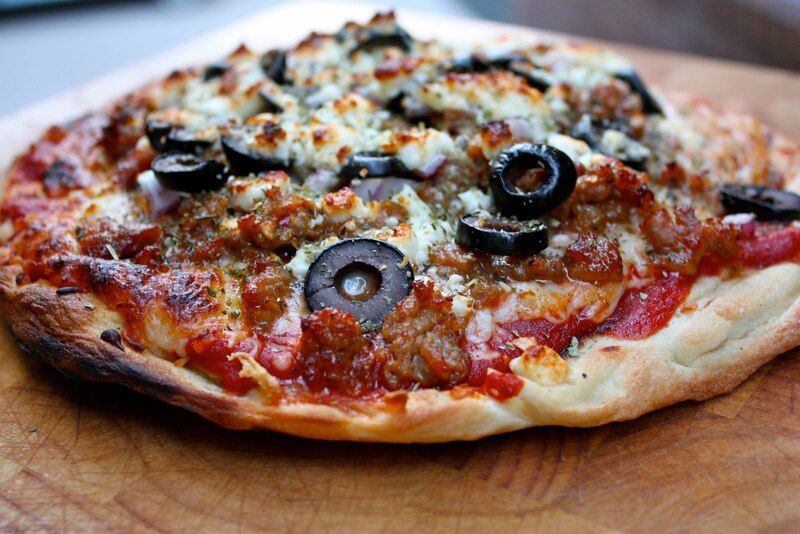 Homemade is much easier than it looks, so give a try, kneading dough is fun!